Eternal Springs Shrine is Taroko's most famous landmark, but the gorge becomes much more beautiful further inland. Taroko Gorge has long since been considered Taiwan's top tourist attraction, and rightly so. About a decade ago, after Taiwan was first opened to Chinese tourists, the park almost reached breaking point, but now that the Chinese government is restricting the numbers of its citizens it allows to visit Taiwan, the park is much quieter. With careful planning it's possible to enjoy the park in peace and quiet, especially Tianxiang and the trails further into the gorge (see Taroko Gorge Hiking Routes). Taroko Gorge's giant cliff faces, heavy rainfall and frequent earthquakes make landslides and rockfall a very real risk, especially along the many paths which are literally chiselled into the cliffs. Please consider the status of your dependants, life and accident insurance, faith, karma or whatever else you see necessary, but understand that you're taking a small but significant risk entering Taroko Gorge. On paths which are cut into the rock it's better to walk as close as possible to the cliff face, so that rocks have less far to fall and any rocks sliding down the cliff should pass over you. Hard hats are recommended for Swallow Grotto (currently closed, in early 2019) and Lushui Trails, but are not officially required (and infrequently worn) for the Shakadang Trail. A helmet won't save you from a landslide, but makes a significant difference for smaller rocks as the impact is spread more evenly over the skull. Helmets can be borrowed (free) from the visitor's centres, but must be returned to the same one that day, which can be inconvenient if staying in Tianxiang. I recommend visiting the visitor's centre for advice on which trails are open. Safety rails are often non-existent or lower than the centre of mass of a tall westerner, making it easily possible for a tall person to lean over and fall, especially while carrying a heavy pack or among crowds pushing past. This is especially so at the Xiangde Temple pagoda in Tianxiang. I recommend leaving your pack at your accommodation, a locker at Hualien or Xincheng Station (currently unavailable in early 2019, as the station is being upgraded) or at the Taroko Gorge Visitor's Centre. Signs warn of wasps and venomous snakes. It's best to make sounds as you walk (conversation is fine) as the snakes are as afraid of humans as vice versa. If you do meet any snakes back away gently and they probably will too. Many paths pass through tunnels without lighting. It doesn't need to be especially powerful; a pocket-sized LED torch is fine, but a single-LED keyring style one won't be bright enough for some of the larger trails. Neither will a mobile phone. It rains a lot in Taroko Gorge. The low clouds give the gorge a new kind of magic, but being drenched probably doesn't. Like most public toilets in Taiwan, many along the trails don't have any, and there are limited numbers of place to buy it. Food in Tianxiang has had a reputation for being bad for a very long time, so it's best to stock up before coming. I recommend vegetarians and vegans go to the Loving Hut in Hualien. 5. Loose change for the buses (if you won't buy a day pass or take a private tour). The majority of visitors to Taroko Gorge stay at Hualien, and take the public transport or private tours to the gorge (see below). Unless you want to start very early from Taipei, it's certainly more convenient to have your first night in Hualien, and there are some interesting things to see in the city. 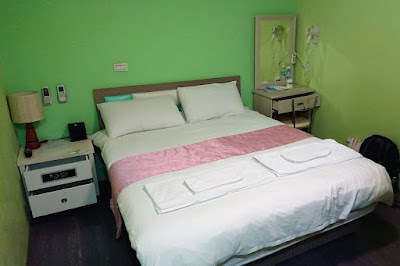 In Hualien I recommend City Home B&B, which is one of my favourite places to stay in Taiwan, and for such beautiful rooms it's excellent value on weeknights at around NT$2,000. This is my favourite place to stay in Taiwan, and usually the only place I splash out and spend more than I need to. I recommend that all travellers spend at least a night in the gorge itself. See my page on Tianxiang for accommodation options. As an alternative, an increasing number of accommodation facilities are springing up around Xincheng Station, two stops north of Hualien and at the foot of the gorge itself. On my most recent update I stayed at the Xincheng Old Street B&B and cannot recommend it enough. It was a short walk from Xincheng Station, had buses directly into the gorge, and the staff were incredibly kind and helpful, and even sourced vegan food for breakfast. And at NT$1200 (on a weeknight) it was incredible value. Yu's Homestay is in a beautiful setting two kilometres from Xincheng Station, so is less convenient but more beautiful, and gets rave reviews. Rooms at the Xincheng Old Street B&B are simple but everything one needs (including an attached bathroom) and excellent value at around NT$1200 (weeknights). Xincheng is still very undeveloped, with few food options except convenience stores, so bring plenty of food and snacks, especially if you are vegetarian, vegan or have other dietary requirements. A tour bus passes through Swallow Grotto. The cheapest way to get to Taroko Gorge from Hualien is by the excellent public bus system. Buses depart from the orange bus station to the left of the train station as you walk out the main exit. As of January, 2019, the earliest bus from Hualien leaves at 6:30AM, and the last bus departs Tianxiang for Hualien at 6:00pm. This schedule is likely to change, so it's important to get a copy of the timetable from the bus station before you leave. The buses for Taroko Gorge depart from the orange bus station (outside Hualien Station). A day pass costs NT$250 or a two-day pass 400, so it's well worth buying one if you intend to spend a full day in the gorge. Alternatively a trip from Hualien to the gorge costs between NT$100 and 200. This is an ordinary local bus system, and many of its passengers are locals going about their daily lives. As such expect minimal service - know where you're going (in Chinese if possible) and have the correct change, so don't leave without at least NT$300 in coins. If the driver doesn't speak English you can always offer an outstretched palm with a range of coins, and s/he will take the right amount. Also note that while from my experience the buses here are reliable (in that they will come) weather and road conditions can cause delays, so be prepared to wait quite a while for the bus. The sign above is the best indication that it's a public bus. Finally, many people have difficulty figuring out which bus is the public bus among the sea of tour buses. They are generally smaller, but the key thing to look for is the sign as it approaches. And of course other buses won't stop for you! Taxi touts abound around the train station, generally offering day tours for around NT$3000. While most should offer a reasonable tour, I would recommend following a recommendation from your hotel. Combined tours generally go for around NT$700 per person, but it depends on the number in the group and how long the tour will last, and how deep into the gorge it takes you. City Home B&B offer their own excellent tour services. Cycling the gorge, and continuing on to Lishan, NE Asia's highest peak, is by all accounts an incredible experience, but not one for their faint hearted, literally or figuratively, as it passes over Asia's highest road. But it covers some truly spectacular scenery, comparable to many European mountain vistas. It's then possible to ride on to Sun-Moon Lake and Taichung. If you just want to see the gorge it's possible to hire bikes in Hualien or in the gorge, but I don't recommend it due to the narrow roads, fast cars and all the tour buses. Scooters carry many of the same risks as bicycles, with the added risk of being able to go fast. It is an incredibly functional way to get around, allowing one to stop off and take photos or explore anywhere at will. Prices generally start at around NT$200 per day (plus fuel) and require an international drivers license or local scooter license. If you don't have a license, know how to ride a scooter and want to try you may find someone willing to rent you one without the right paperwork, but note that your insurance probably won't cover you in an accident, in which case you may well be liable for all the damages, regardless of who's at fault. And accidents are very common on these tiny roads. Many of the benefits of a scooter also apply to a car, but again with the narrow roads and ever more limited parking space by the entrances to the main hiking routes I don't recommend it. Driving in the gorge is best left to the professionals. Xincheng Station is closer to Taroko Gorge than Hualien, and starting from there will cut most of an hour off the bus journey from Hualien. The Taroko Express trains, however, don't stop there, but if coming from Taipei it may be worth changing trains at Yilan (or elsewhere - ask the clerk when you buy your ticket) and getting off at Xincheng. Also, if you will be going north after your day at Taroko Gorge (eg to Jiaoxi or Yilan) consider leaving your bags in lockers at Xincheng Station (currently not possible in early 2019, as the station is undergoing renovations). You'll need to get off the bus and on to the next one (or take the train from Hualien and a bus from Xincheng to the gorge) but it's worth saving an hour back to Hualien just to collect your bags. Or leave them at the Taroko Park Headquarters Visitors Centre (below), but you need to be back by 16:45. 1. A book of hiking routes. 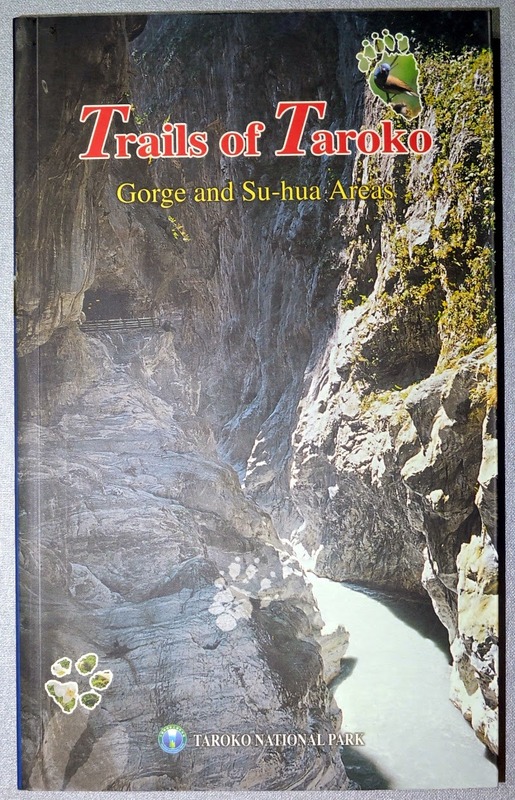 If you wish to hike extensively in Taroko Gorge (for more than a day or two, or for any of the hikes which require a permit), pick up a copy of Trails of Taroko from the gift shop (240NT). Simple maps of Taroko can be picked up at the visitors centre beside Hualien Station, but this book can only be purchased at the park headquarters. It's also not a bad idea to get the latest update on which paths are open and how far, and any dangers to be aware of. If you will visit Swallow Grotto and / or Lushui Trail, borrow a helmet (free). The helmets must be returned the same day, by closing time, as they have a limited number. Storage is available from 8:45-16:45. There are no coin lockers. The're a simple cafe which does traditional rice-based dishes, including a vegetarian/vegan (全素) meal set, but it would be much better to eat in Hualien before you leave or when you get back to Hualien (or Taipei). Consider spending a night or two at Tianxiang. Consider taking a bus or private transport up to Lishan (coming soon).